Necessity is the mother of innovation. As cliché as this may sound, it proved to be true for one Southern California small business owner a few years ago. And now he is reaping the benefits. Tom Rieser, owner of T.R. 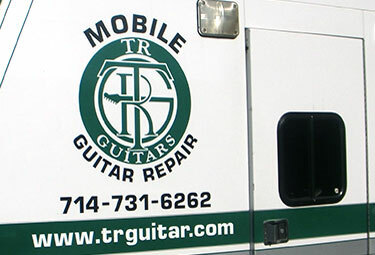 Guitars started repairing and building custom guitars more than 30 years ago. He transformed his passion into a small business, and was enjoying the entrepreneurial lifestyle, when the economy suddenly tanked. After more than 20 years in business, Rieser was faced with the possibility of closing his doors. The 2500 square foot building he leased was eating the meager profits that he was working twice as hard for. He knew he couldn’t continue the way he was going, but he just couldn’t bear the thought of losing his business. Since Rieser started his business long before the internet boom, he cherishes the lost art of eye contact, a handshake, and a smile. Shortly after he cut his expenses and went “mobile” his profits picked up, and he was getting more business than he could handle. When asked what advice he would give to struggling business owners and startups, he emphasized the basics. Tom says he’s s not a big “internet guy”, but several years ago, he felt compelled to at least start a Facebook page. He thought he’d experiment with a little social media. He reached out to his customers, asking for their advice about which color he should use for a guitar he was designing. That single post caused his Facebook page to go viral. Tom now encourages entrepreneurs to experiment with social media because it’s free, and a great way to connect with customers. He is an advocate of taking smart, calculated, small risks. Partnerships: Form partnerships with non profit organizations and like-minded businesses in your area. Work together and cross-promote. Offer free advice and services: This adds value, builds trust and encourages customers to return. Upload a video to YouTube: Teach viewers how to do something, or solve a problem that is relevant to your industry. If you don’t know how to use YouTube, ask a high school student to help you out. You can incentivize him with a gift card to Starbucks, Amazon or iTunes. Ask for referrals and give incentives for referrals. Create an event: advertise it via social media, word of mouth and email. Distribute flyers, postcards or posters. Place large magnets on your car doors. Attend trade shows: network, learn, get inspired. If you need to hire an independent contractor, check sites like www.odesk.com or www.elance.com. Hold a class or workshop. Don’t be afraid to fail – persistence pays off. If you are thinking about closing your doors, first, try a few actions on the list. Then write down five things you can do to cut expenses. Above all, remember that necessity is the mother of invention!